UPDATE 4:55PM: Charges filed. Details here. A gunman who shot three people in Lakeview overnight is in custody thanks to the quick and gutsy response of Chicago police officers. Cops on patrol heard gunfire in the 2900 block of North Sheffield at 2:45 a.m. and saw a man running with a handgun. They chased the man into an alley and took him into custody behind the 1000 block of West Oakdale. Police found a gun nearby. Police found the other two shooting victims nearby. None seemed thrilled about seeing the officers, according to a resident. A 23-year-old man is being treated at St. Joseph Hospital for a gunshot wound to his foot. A 24-year-old man and a 23-year-old woman each suffered one gunshot wound to the back of a leg. They are being treated at Advocate Illinois Masonic Medical Center. All of the victims are in good condition, police said. Witnesses reported seeing a man in a blue and white hoodie run west on Oakdale after firing shots in the middle of Sheffield Avenue, just south of Oakdale. Photos from the scene show police detaining a man in similar clothing. This morning’s shooting unfolded steps from the spot where 25-year-old Kevin O’Malley was shot to death in a robbery-gone-bad on May 30, 2015. As in today’s shooting, police doggedly pursued a suspect on foot and arrested 22-year-old Kristopher Pitts at the Wellington Brown Line station. Pitts’ case continues to wind its way through the court system. His next appearance will be on November 9. Just last weekend, a double shooting left two people critically injured less than a half-mile from today’s incident. 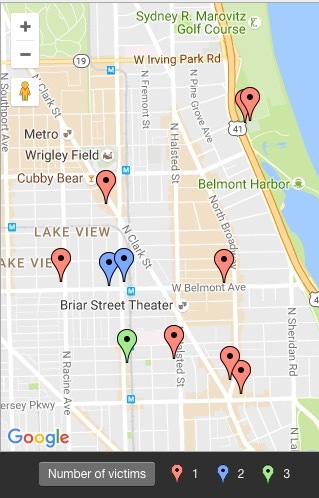 Fifteen people have been shot in Lakeview so far this year compared to three in all of 2015. One of this year's victim died. Police determined the case to be a justifiable homicide.